Dendrobiums are warm growing tropical orchids that produce long lasting sprays of exotic blooms from the apex of the canes. Can get very large with time. LIGHT: Very bright filtered light. Early morning and late afternoon direct light ok.
FEED: Full strength balanced liquid feed every other watering. WATER: Allow mix to get almost completely dry between watering, then water thoroughly. 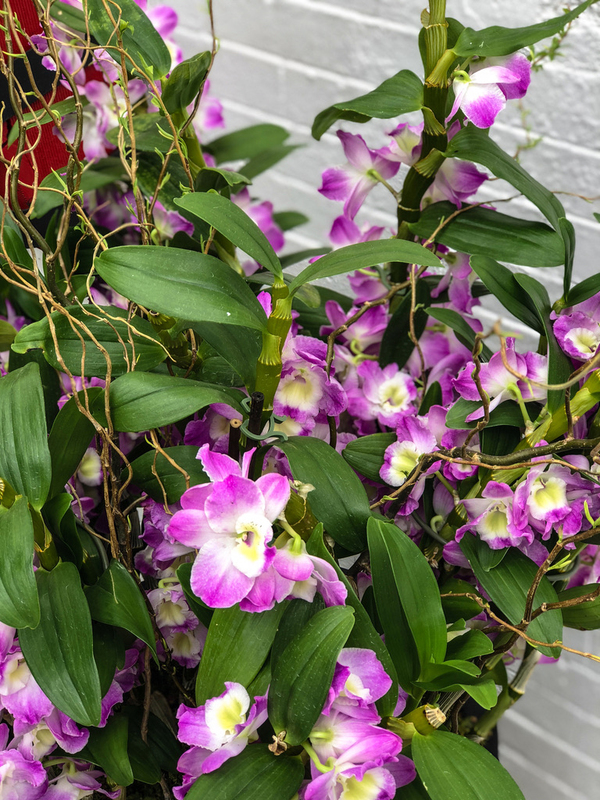 Nobile Type Dendrobiums are winter blooming orchids that produce clusterd of beautiful, long lasting flowers opposite each leaf along the lengths of the canes. LIGHT: Very bright filtered light. No direct sun. FEED: Weekly with half strength balanced liquid feed when growing. Stop feeding in Fall when canes mature to induce flowering. WATER: Allow mix to get somewhat dry between waterings, then water throughly. TEMPERATURE: 80-85 Day, 60-65 Night. Reduce night tempt to 55 or less in Fall to induce flowering.